Here are some Twitter automation tools, services and tips, which when used the right way, can be a valuable addition to your social media strategy. And when I say the right way, I mean that you should be using these to supplement your regular social engagement and not only using these tools to give your account the look of activity. Twitterfeed is a service that allows you to set up RSS feeds from your favorite blogs, and whenever those blogs have a new post, it will be tweeted to your account. It can be used to update your Twitter and Facebook accounts. To use Twitterfeed, you simply need to register for a free account and then set up your favorite blogs using the following steps. 1. Enter an easily recognizable Feed Name and the blog URL or RSS feed URL. Twitterfeed Setup Step 1: Enter the feed name and blog or RSS URL. 2. Use the advanced settings to customize your tweets. I usually change the Post Content to Title Only and include via @username of the blog owner in the Post Suffix. Twitterfeed Setup Step 2: Configure Advanced Settings. 3. Choose the Twitter or Facebook accounts that you would like to have updated with the blog’s latest posts. Twitterfeed Setup Step 3: Set to update statuses on specific Twitter or Facebook accounts. You’ll need to use the “OAuth” authentication for new Twitter accounts and “Connect” with Facebook for new Facebook accounts. So what benefits can you get from using Twitterfeed? If you choose the right blogs that your audience enjoys, you’ll be able to give them the latest news from their favorite sites and they will appreciate it! If you choose blogs that your followers like, you will receive plenty of thanks. Generally, you’ll know if your audience likes them because you see retweets of those status updates or, if you’re really good at choosing the right blogs, you’ll get thank-you messages for posting them, like the one above. So what’s the downside of using Twitterfeed? As far as I know, there isn’t a way to say when to tweet new posts. Sure, you can tell it to only check every certain number of hours, but even then it doesn’t let you say only between the hours of 9am and 5pm, for instance. Another little quirk is that if you send an update that you want to stay at the top of your Twitter profile for a while, you might be out of luck if one of your blogs in Twitterfeed has recently updated right after your priority tweet. The last one has to do specifically with affiliate marketers. If you’re promoting an event, such as the Social Media Success Summit, the last thing you want is to tweet a post promoting the same event (with someone else’s affiliate link). But it’s likely to happen if other blogs in your Twitterfeed are promoting the same products or events. So what best practices should you follow if you want to get the most out of Twitterfeed? Here are some good tips. Try not to include blogs that update multiple times a day. Nothing will annoy your followers more than seeing 12 updates from the same site in one day. If you feel you must include one of those sites, be sure to use the Advanced Settings and only check the blog once every 4 hours and only tweet one update at a time. Only choose blogs that you can depend on to have quality posts. I find that including blogs like Social Media Examiner which only feature posts on specific topics are the safest, while personal blogs that have the occasional rant post are a little more iffy. The last thing you want is to automatically tweet posts that may offend your readers. Be sure to monitor your tweets regularly to make sure your favorite blogs haven’t veered off topic. Your favorite photo blog may have decided to go culinary which may not resonate with your followers. Ah, the dreaded automated direct message. I wish I could greet all of my new followers with a personal direct message or a friendly mention, but it becomes tough to do once you’re getting a high volume of follows in one day. Plus, it’s sometimes hard to tell which accounts are manned by real people and which are bots, and why would you want to waste precious time greeting a bot? So yes, I like to use Social Oomph to create an automated direct message for new followers. Once you have created a free account (apparently no longer free for new members) at Social Oomph, you can set it up using the following steps. 1. Use the navigation menu and go to Social Accounts > Add New Account > Add Twitter. Be sure to log into your desired Twitter account beforehand and Authorize Access. 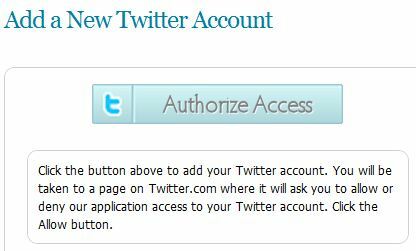 Social Oomph Setup Step 1: Authorize your desired Twitter account. 2. Use the navigation menu to go to Social Accounts > Edit Welcome DM and select your Twitter account. Here, you will find the form to enter your automated direct message and a checkbox to automatically send a welcome message. Social Oomph Setup Step 2: Customize your direct message for new followers. Underneath this setup is also an option to follow your new followers back or place them in a queue to manually approve or reject following them. Social Oomph Setup Step 3: Automatically follow new followers back. I always follow people back for one main reason. As you can see from my automated DM, I give them the opportunity to contact me privately, and if I’m not following them, they cannot do that. In general, I feel that if someone is connected with me, they should be able to contact me privately like they can on Facebook or LinkedIn. If done correctly, you can make your new followers feel very welcome and open a good line of communication with them right off the bat. With my direct message, I also have the added bonus of discovering new questions from bloggers and social media users which have led to some good topic ideas for my blog. If done incorrectly, you can put off users who are anti-automated direct messaging. I have tried out a few variations of direct messages, and unfortunately have had some that did not generate good feedback. My latest has been all positive though. The following will ensure that you keep your new followers once they receive your welcome message and not generate a lot of negative feedback. Don’t try to sell new followers anything in your welcome DM. Period. Don’t try to get your new followers to sign up for your mailing list—this includes trying to tempt them with a free gift. I rarely (unless I know the user) ever click on a rogue bit.ly link for a free anything in an automated DM. The most successful direct messages I’ve tried do not come with any links at all. These are seen as more trustworthy and can open the door to further communication. The second most successful direct messages I’ve used are ones that simply link to blog posts that my new followers would be interested in. If you know that you have an audience following you for blogging advice, then your latest blog post with 100 great tips for new bloggers might be well received. Be sure to check your direct messages regularly and respond to them when necessary. This is a huge trust-builder and will lead to more engagement in the future. 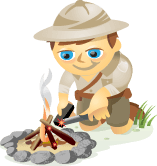 Tweet Old Post is a great plugin for WordPress users. It allows you to connect a Twitter account with your blog and regularly tweet posts from your archives to your followers. Setting up Tweet Old Post is simple. Follow these steps once you have logged into your self-hosted WordPress blog and related Twitter account. 1. Go to your Dashboard > Plugins > Add New and search for Tweet Old Post. 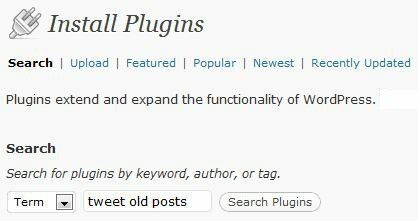 Tweet Old Post Step 1: Search for the Tweet Old Post plugin in your WordPress dashboard. 2. Click on the Install Now link below the Tweet Old Post plugin by Ajay Matharu. Tweet Old Post Step 2: Install Tweet Old Post plugin from the search results. After you’ve installed it, you’ll need to activate it on the next screen by clicking on the Activate Plugin link. 3. Scroll down to the bottom of your dashboard and go to Tweet Old Post > Tweet Old Post to get to the main settings for this plugin. Tweet Old Post Step 3: Configure settings for Tweet Old Post plugin. Sign in with Twitter to the Twitter account from which you want to tweet your post archives. In the Tweet Prefix field, you can set something like From the Archives or similar text. Check the URL shortener box to use shortening services like bit.ly which will require an API key that you can get when you register for a free account at bit.ly. Create default #hashtags to go with your tweets, such as #blogging or #socialmedia. Set the minimum and random intervals to send tweets, considering whether you want to tweet posts from your archives one or more times per day. Set the minimum age of posts to be tweeted. Exclude particular categories from being tweeted. 4. If you have specific posts from included categories that you want to exclude from being tweeted, use the Tweet Old Post > Exclude Post settings to pick certain posts to exclude from being tweeted. Tweet Old Post Step 4: Exclude specific posts from being tweeted by Tweet Old Post. Chances are, you gain new followers to your Twitter account and blog on a daily basis. Using Tweet Old Post is a great way to point new followers to some of your awesome content from the past. It’s like having a Related Posts section that plugs into your Twitter account. Some followers may not be as open to older content, especially if that content is outdated or they’re simply the type who only likes new and fresh blog posts. To make sure your followers are only getting your best content, consider the following tips. Create a category to house only your best content, then go back through your older posts and add them to that category. This way, you never have to worry about anything that you don’t want to be tweeted from your archives, and you don’t have to mess with excluding posts on an individual basis. Be sure to exclude posts that are time sensitive from your archive’s tweets, such as a special discount that has since expired for a product or event information that has already passed. Don’t overdo tweets to your older posts—you don’t want your stream to look like it’s all about you and nothing else. HootSuite offers an option to schedule updates to specific social media accounts, which can come in really handy if you have items that you would like sent at specific times when you may be away from your computer. The following will help you set up scheduled updates to be sent from your Twitter accounts linked to your main HootSuite account. 1. Enter your desired status update in the box as you would like it to appear and select the accounts to which you would like it posted. HootSuite Scheduling Step 1: Enter your status message as you would like it to appear. 2. 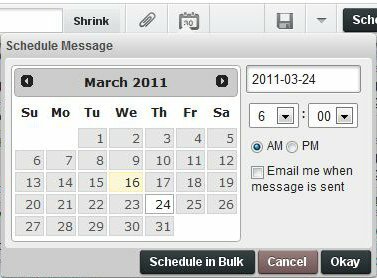 Click on the calendar button to bring up a scheduling calendar to select your desired date and time to send the status update. HootSuite Scheduling Step 2: Schedule your status message by date and time. You will also notice the Schedule in Bulk option. HootSuite Scheduling in Bulk: Schedule multiple messages all at once. From here, you need to download a .CSV spreadsheet file so you can enter dates, times and tweets to schedule if you want to do more than one at a time for a specific account or set of accounts. 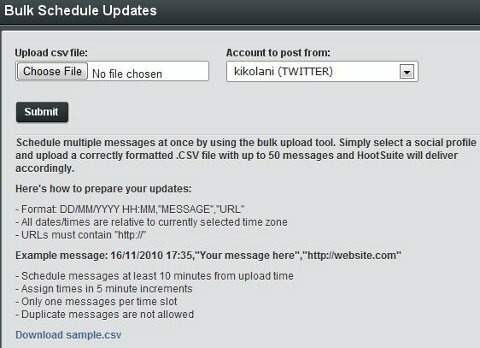 HootSuite Scheduling in Bulk: Use a .CSV to format your status messages for bulk scheduling. 3. Need to make a modification or cancel a scheduled update? Create a column for your Pending Tweets in HootSuite to see what you have scheduled. Use the Edit link to make changes or the X to delete the update. HootSuite Pending Tweets: Edit or delete scheduled messages in this column. Time-sensitive tweets can be scheduled in advanced so you don’t forget to send important messages in a timely fashion. This is great for affiliates who are promoting the last few hours of a discount or special, speakers who want to send a countdown to their upcoming webinar or anyone who wants to keep his or her account updated at a regular rate. Another great use for scheduling is when you’re reading through article after article that you want to send to your followers. Don’t just send ten articles in a span of five minutes—use the scheduler to space them out over the next few hours instead. If you’re using HootSuite to schedule your messages when you aren’t going to be around the computer, you may miss out on answering people who send quick questions about your latest tweet (if it needs any clarification). There’s a big one here that really applies to any automated social media service: Be sure that your account has more than just scheduled tweets. You want to be engaging with your audience, not just broadcasting to them. The above tools are meant to supplement and enrich your social media experience. They’re not, by any means, meant to replace the most important part of social media networking, which is engaging with your followers and fans on a regular basis. Not every status update should include a link! Do you use any of the above or other tools to enhance your Twitter presence? What results have you seen, good or bad? Leave your comments in the box below.